Ms Jawara is in her late 30s and a single mother of two teenage kids. 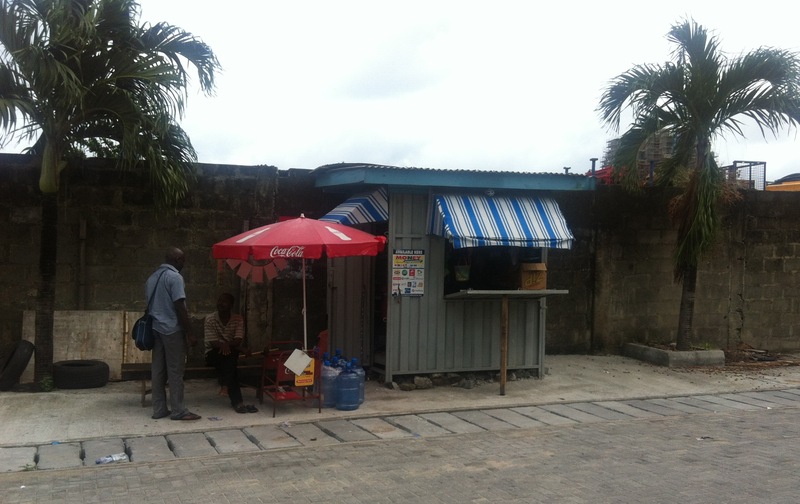 She s also the proud owner of a small street shop on Sinari Daranijo Street on Victoria Island, Lagos. The shop is a tin shack made from a piece of a container. It sells refreshments and sweets and medical tablets and top-up cards for mobile phones, and just about everything in between. She began her business twelve years ago, ten yards away from its current position, around the corner of the same street. She had no chair, no umbrella, and no container then. In fact, she had almost nothing. She squatted on the bare, moist ground. In front of her there was a piece of soggy brown carton ripped up from a box. On the carton, her shop s display, the first merchandise: three packets of biscuits and two bottles of soda. Lagos is home to an estimated twenty million people, a sprawling, anarchic, dirty, ugly African metropolis. It is the commercial centre of a country awash with oil and gas. It is estimated that around 2% of Nigeria’s 160 million people are millionaires. They live in opulent houses, in enclosed and well-protected estates on Banana Island and Lekki; they have servants, drivers, bodyguards, gardeners, several luxury cars, and houses in London and Geneva. A growing minority earns a meagre salary working for these masters. Of them a few are climbing up the economic ladder fast; there exist many opportunities for the hard working, the smart and the well connected. The remaining multitudes are in the streets, hustling for a living. There is no State here, at least not in the sense that we in the West expect a State to be. What is called a “State” here is a power structure that controls natural resources and security, and is run by an oligarchy, for the oligarchy. Elections are a nominal, make-believe way of legitimising the monopoly of the mighty oligarchy in the eyes of politically frigid westerners. Nevertheless, the oligarchy is by no means at peace with itself. Competition amongst its members is fierce. Nigeria is very rich, its GDP the highest in Africa. The spoils awaiting those who control the corridors of political power aplenty. Occasionally, sleepy bodyguards turn into stealthy assassins of political rivals. Occasionally too a certain number of the multitudes rebels. It was Biafra when Nigeria first got its independence in the 1960s. Ten years ago gangs took up arms in the Niger delta, where most of the oil is drilled. They kidnapped foreigners who worked for the big oil companies. After several unsuccessful security operations their leaders were made business partners. They joined the oligarchy. There is relative peace now in the Niger delta. Indeed, the president of the country comes from there. Nowadays a new, and far more horrific, war takes place in the Muslim North. A militant group that call themselves Boko Haram – and who believe the earth is flat – is in a killing spree, burning down schools and murdering children. Boko Haram broadly translates in “knowledge of the world (the one written in books and taught at schools) is for the infidels”, i.e. the work of Satan, a sin. No one is sure what these people want. Perhaps they want nothing. Perhaps their insufferable bigotry and religious madness aims for that does not exist, and cannot exist. Thankfully, in Nigeria, people like them are a negligible minority. Ms Jawara is typical of what most Nigerians are like. Twelve years ago she sold those three packets of biscuits and the two soda bottles. With the proceeds she managed to buy more goods to sustain her business, whilst tending to her young children at the same time. She slept on the carton box night after night, not to lose the prime position. The corner, her corner now, is in the midst of many company office buildings. She understood perfectly well the significance of location for a small retail outlet. A year later someone gave her a wooden plank. She scrambled together a few rocks and made a table out of it. She found a half-broken stool to sit on. She borrowed money and bought a few more bottles of soda. People liked her. She was pleasant and friendly and always smiling. When they came down from their offices to begin the long, long travel back to their homes, they would spare a few naira to buy something from her. She bought an umbrella to protect her from the rains and the heat. She could sleep on dry ground now. And after a while she bought more things to sell. Twelve years later she had put aside enough money to buy her beautiful kiosk. She s now dreaming of expanding. Maybe another shop like that in another street corner, and then another, and another.